This is not a complete game. You must own a WW1 Wings of Glory â€” Starter Set to play or WW1 Wings of Glory â€” Rules and Accessories Pack to play. The Fokker E.III was a German single-seat monoplane fighter, the first aircraft armed with a synchronized, forward firing machine gun. This airplane has been also used by the Austro-Hungary Empire and Turkey during World War One. The Fokker E.III was the definitive version of the Eindecker, with larger, newly designed wings than the original Fokker and was piloted by Aces as Max Immelmann, Hans-Joachim Buddecke and Oswald Boelcke. 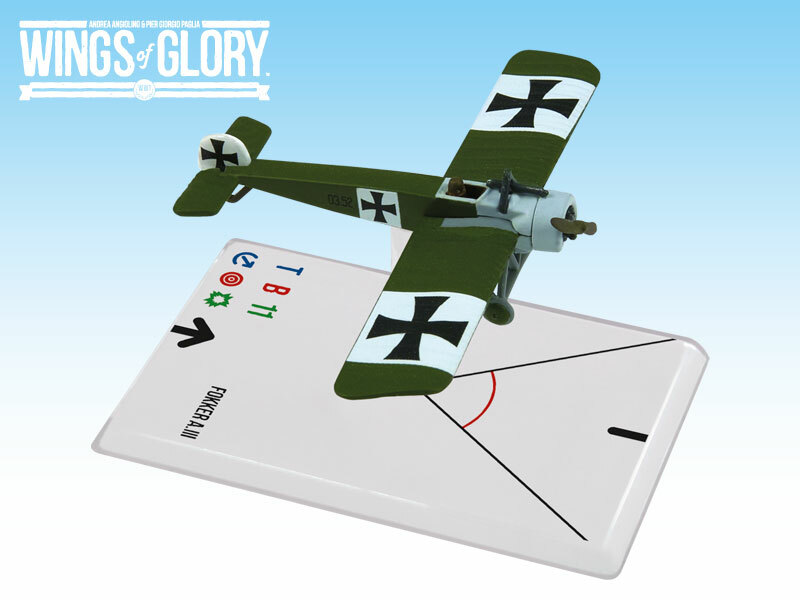 Designed to be used with the popular air combat game system created by Andrea Angiolino and Pier Giorgio Paglia, each WW1 Wings of Gloryâ„¢ Airplane Pack is a ready-to-play model, painted and assembled, 100% compatible with any other WW1 Wings of Glory game product. In each pack you will find all you need to play with the airplane: a special base with gaming stats, a variable altitude flying stand, and a specific deck of maneuver cards. Other products in the "wings of glory" series.